The indicator shows the population trend of selected bird species. This trend is, in the long run, a good indicator of the state of the environment. When the conditions are bad, the population size is small, and when they are good, the population is large. Since birds live in various ecosystems, they provide us with the possibility to determine changes to the state of the environment in the forests, cultural landscape habitats, wetland habitats, at sea, in mountainous areas, as well as within settlements. Changes among breeding birds (spring, summer), migrating birds (spring and fall) as well as wintering birds (winter) can be observed by different bird counting methods. Birds are rather simple to determine, easily seen, therefore many self-taught nature lovers participate in the counting. Birds are thus the most often selected object worldwide for monitoring large-surface changes in the environment. The indicator with selected species shows the population of birds breeding in the cultural landscape, as well as species breeding in the forests, their trend during wintering and especially the trend of the common tern as an example of a colony-maintenance dependent population. Božič, 2005, 2006; Polak, Kebe and Koren, 2005. Figure NB01-3: Number of breeding lapwings (Vanellus vanellus) at the Ljubljana Marshes (Ljubljansko barje). Data for the years 1998, 2003 and 2004 have been gathered by calculating the state determined at some representative parts of the marshes. Štumberger, 1997; Štumberger, 1998; Štumberger, 1999; Štumberger, 2000; Štumberger, 2001; Štumberger, 2002; Štumberger, 2006; Božič, 2006, 2007. 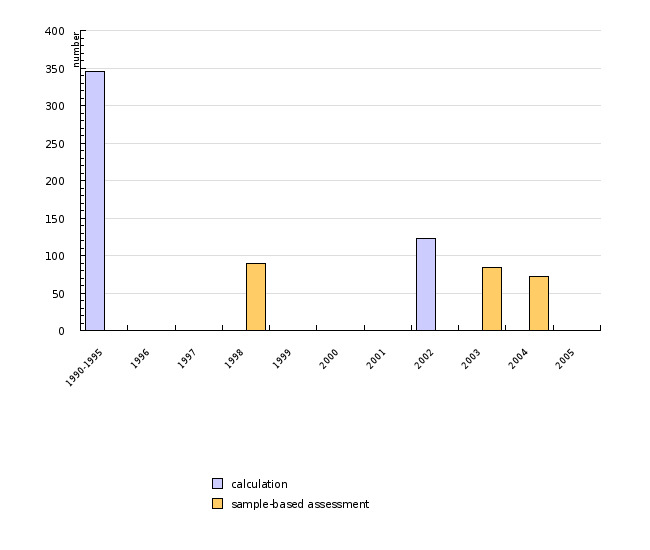 Denac, 2001, unpublished data, 2002, 2003a, 2003b, 2004; Bračko, 1999; Makovec, Škornik and Lipej 1998; Šalamun, 2001; Vogrin, 1991. Figure NB01-6: Population trend for three forest owls, the Tawny owl (Strix aluco), the Ural owl (Strix uralensis) and the Boreal owl (Aegolius funereus) on Krim. The population index for the Tawny owl was not assessed in 1997. To preserve a high level of biodiversity and to halt the decline in biodiversity by 2010. Slovenia has a long-standing bird-watching tradition, but only a short systematic data gathering tradition. The oldest aspects of the latter are data gathering as regards wintering birds on water surfaces, which has been organized since 1984 by the Bird Watching and Researching Society of Slovenia (DOPPS) within the framework of the international counting (IWC), and the fall bird migration monitoring at the ornithological station Vrhnika pri Ljubljani, carried out since 1987 by the experts from the Slovenian Museum of Natural History. Most data still remain to be published. Apart from data concerning certain endangered species, the knowledge on bird migrations is unsatisfactory. According to the existing data on bird population trends we find that the state of the environment in the cultural landscape is deteriorating, while the conditions in wetland habitats and in forests have more or less remained unaltered. The observed fluctuations form part of natural population changes; conversely, the changes among species are more or less balanced (populations of certain species are on the increase, of others on the decrease). A rather significant number of bird species have disappeared in the last decades from the Slovenian breeding birds’ list or have become virtually extinct (the common snipe Gallinago gallinago, the European roller Coracias garrulus, the lesser grey shrike Lanius minor, the lesser kestrel Falco naumanni, the little owl Athene noctua …). The population trend for bird species which breed in the cultural landscape is shown by means of three selected species: the white stork, lapwing and corncrake. The white stork (Ciconia ciconia) population in Slovenia is stable. The number of breeding pairs rose in 2004 due to immigration and is not attributed to an improved state of the environment. 2005 and 2006 were extremely bad for the white stork. The number of pairs to have started breeding was low, the breeding success was also poor. While the low reproduction in 2005 was a consequence of a very late arrival of the birds to the nesting sites (a similar phenomenon was observed in 2005 all over Europe), the poor success in 2006 cannot be ascribed to a late arrival, since the birds returned normally and in the usual numbers. The low breeding success can be attributed to highly unfavourable weather during the breeding period. It is a known fact that the breeding success of the white stork heavily depends on weather conditions. In late May 2006 Slovenia was engulfed in strong rains, followed by a sudden cool spell, with such weather lasting for over a week. Especially in North-Eastern Slovenia, the offspring mortality rate in 2006 also incremented due to strong thunderstorms with hail physically killing off the offspring, which was recorded at various nests. The lapwing (Vanellus vanellus) and the corncrake (Crex Crex) are typical breeding birds of the extensive cultural landscape whose population has been constantly on the decrease throughout the past years. The corncrake population decrease on the Cerknica Lake is small, as the farming has not changed considerably. 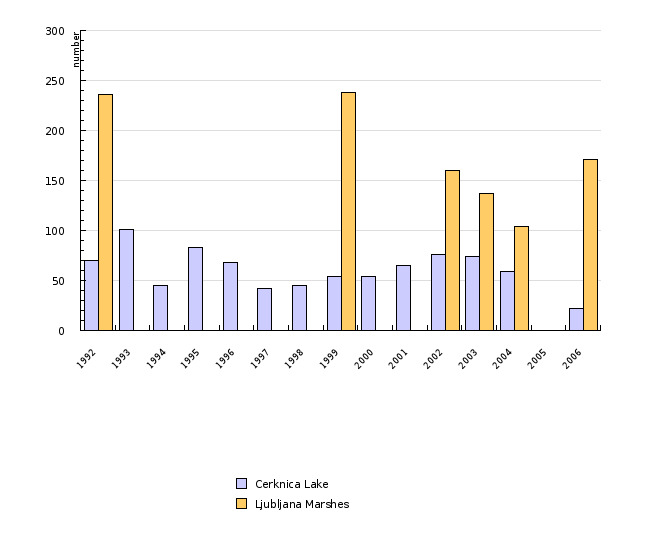 The small number in 2006 is ascribed to bad weather and the high water level of the lake during counting. Despite a slight rise in 2006 it is estimated that the population relative to the state in 1992 has fallen almost by half. During the same period the lapwing population size decreased by a third. All changes are a consequence of a premature transition from extensive to intensive farming, which has deteriorated the environment in terms of nature. 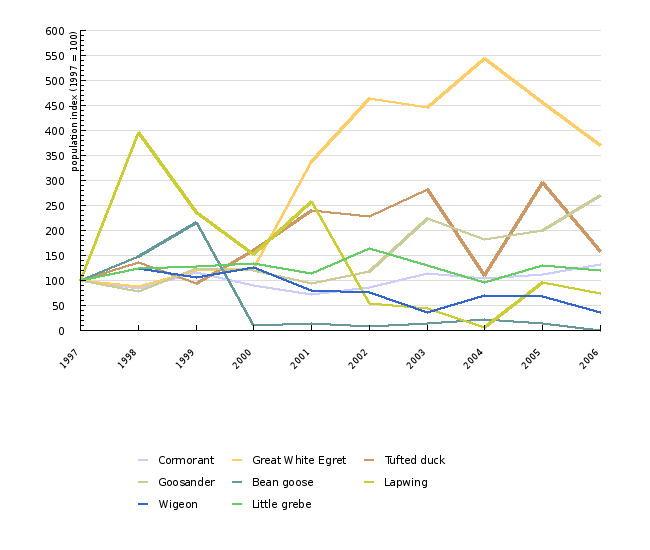 The bird population trend during wintering shows six selected species: the cormorant, the great white egret, the tufted duck, the goosander, the bean goose and the lapwing. The abundance of cormorants (Phalacrocorax carbo) has been on the rise since the species was granted protection in the previous century. It has further strengthened due to a larger amount of nutrition in organically enriched waters. The wintering population in Slovenia has remained stable in the last years. It is considered to be at the level which can be sustained by the available fish. The great white egret’s population has increased because of a hunting prohibition. Since the prohibition, increasing numbers of the great white egrets have been wintering in Central Europe and a rise has also been observed in Slovenia. 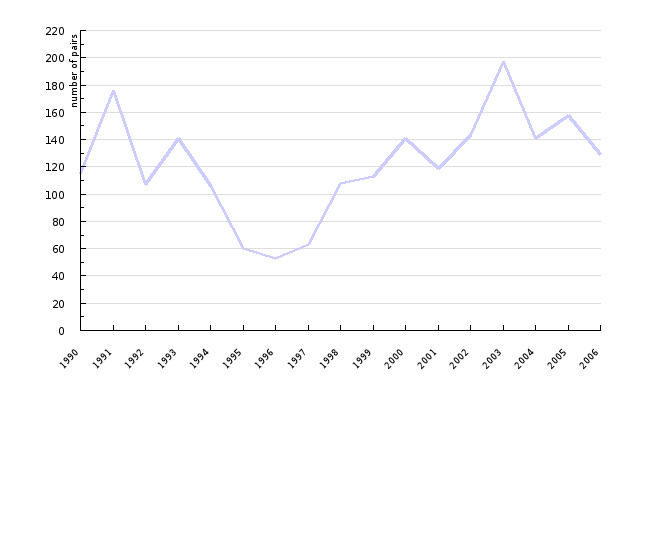 It is still too early to say whether the 2005 and 2006 decrease signifies the start of a long-lasting trend. The rise in abundance of the tufted duck (Aythya fuligula) may be connected to the invasion of the zebra mussel (Dreissena polymorpha) into European continental waters, which represent a rich and easily accessible nutrition source during winter. The alpine population of the goosander (Mergus merganser) has been on the rise due to a hunting prohibition, although an increased nutrition supply in organically enriched waters and installed nesting sites probably also contribute to the greater numbers. The bean goose (Anser fabalis) on the Ormož Lake has thinned down. In Slovenia, the lapwing (Vanellus vanellus) only winters at the seaside. Its abundance has been changing throughout the years depending on the weather conditions. Just like in 2005, in 2006 the common tern nested in North-Eastern Slovenia only at two nesting sites: on the nesting rafts provided in the pools of the Sugar Factory Ormož (Tovarna Sladkorja, d.d.) and on a newly-built island of 830 m2 on the Ptuj Lake. The survival of the continental population of the common tern thus entirely depends on the management of these two nest sites. The management of this species has given rise to numerous new questions which are essential for its protection and preservation in the future. Sugar factories are being closed as a consequence of the sugar sector reform in the EU and the current operation season of the Sugar Factory Ormož will be its last, which could also signify a noteworthy fall of the common tern breeding population in the upcoming years. The common tern population is also decreasing due to constant competition with the black-headed gull for nesting spaces. A short-term solution to this problem is to be sought in terms of management methods, which will divert black-headed gulls from settling on the island. Since the rest of the common tern population in the south-western part of Slovenia is also wholly dependent on artificial nesting places, the destiny of the common tern completely depends on further management activities and available human and financial resources for this purpose. The population trend for forest-nesting birds is shown by means of three selected species. The forest bird population monitoring in Slovenia is rather undeveloped, except for hunters’ statistics concerning grouse, whereby the methodology in the field still awaits a clear definition. The population of three forest owl species in the Dinaric forests on Krim by Ljubljana has been monitored in the framework of research conducted at the National Institute of Biology. All three species are predators and typical cavity-nesting birds as well as good indicators of how preserved a forest area is. Their populations remain unchanged. The presented population fluctuations are a common phenomenon in owls, which heavily rely on the population size of their main nutrition, small mammals. Data show a satisfactory forest preservation state on Krim. The same goes for other areas in Slovenia, even though in some places the settlement potential is higher than what is currently being achieved by the species, especially by the Ural and Boreal owls. Aleš, K. 2004: Populacijski trend in izbor gnezditvenega habitata pribe Vanrellus vanellus na Ljubljanskem barju [Population trend and nesting habitat selection of the lapwing (Vanrellus vanellus) at the Ljubljana Marshes]. Acrocephalus 25. Aleš. K. 2005: Populacijska dinamika in gnezditvena biologija pribe Vanellus vanellus na Ljubljanskem barju [Population dynamics and nesting biology of the lapwing (Vanrellus vanellus) at the Ljubljana Marshes]. BSc thesis. Božič, L. 2005: Gnezditvena razširjenost in velikost populacije kosca Crex crex v Sloveniji leta 2004 [Nesting abundance and population size of the corncrake (Crex crex) in Slovenia in 2004]. Acrocephalus 127. Božič, L. 2005: Populacija kosca Crex crex na Ljubljanskem barju upada zaradi zgodnje košnje in uničevanja ekstenzivnih travnikov [Population of the corncrake (Crex crex) at the Ljubljana Marshes decreasing due to early mowing and destruction of extensive meadows]. Acrocephalus 124. Božič, L. 2007: Rezultati januarskega štetja vodnih ptic leta 2006 v Sloveniji [Results of January aquatic bird counting in 2006 in Slovenia] (in preparation). Bračko, F. 1999: Navadna čigra Sterna hirundo [Common tern (Sterna hirundo)]. Acrocephalus 20 (93): 60-61. Čas, M. 2001: Divji petelin – pokazatelj odnosa do gozda. Popis aktivnosti rastišč v Sloveniji v letih 1998-2000 [Capercaillie – indicator of our treatment of the forest. 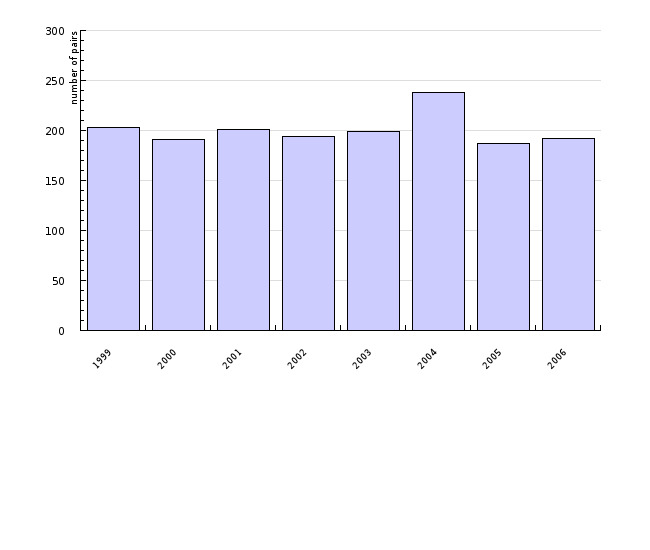 Record of site activity in Slovenia in 1998-2000]. Lovec 84 (6): 286-289. Denac, D. 2001: Gnezditvena biologija, fenologija in razširjenost bele štorklje Ciconia ciconia v Sloveniji [Nesting biology, phenology and abundance of the white stork (Ciconia ciconia) in Slovenia]. Acrocephalus 22 (106-107): 89-103. Denac, D. 2003a: Navadna čigra Sterna hirundo [Common tern (Sterna hirundo)]. Acrocephalus 24 (117): 76-77. Denac, D. 2003b: Navadna čigra Sterna hirundo [Common tern (Sterna hirundo)]. Acrocephalus 24 (119): 149. Denac, D. 2004: Prehranjevalna dinamika in pojav znotrajvrstnega kleptoparazitizma v koloniji navadne čigre Sterna hirundo na Ptujskem jezeru (SV Slovenija) [Feeding dynamics and occurrence of intraspecies cleptoparasitism in the Common tern (Sterna hirundo) colony at the Ptuj lake (NE Slovenia)]. Acrocephalus 25 (123): 201-205. Makovec, T., Škornik, I. & Lipej, L. 1998: Ekološko ovrednotenje in varovanje pomembnih ptic Sečoveljskih solin [Ecological evaluation and protection of important species of the Sečovlje salt-pans]. Falco 12 (13-14): 5-48. Mihelič T., Vrezec A., Perušek M., Svetličič J. (2000): Kozača Strix uralensis v Sloveniji [The Ural owl (Strix uralensis) in Slovenia]. Acrocephalus 21: 9-22. Mikuletič, V. (1984): Gozdne kure [Hazel grouse]. Hunting Association of Slovenia, Ljubljana. Polak, S., L. Kebe in B. Koren 2005: Trinajst let popisov kosca Crex crex na Cerkniškem jezeru [Thirteen years of recording the corncrake (Crex crex) at the Cerknica lake]. Acrocephalus 121. Rubinič, B. 2004: Raziskovalni projekti pri društvu za opazovanje in proučevanje ptic Slovenije [Research projects at the Society for Observation and Study of Birds of Slovenia]. Svet ptic 4. Rubinič, B. 2006: Monitoring populacij ciljnih vrst: Kako gre pticam zadnja tri leta? [Population monitoring of target species: the trend in the past three years] Svet ptic 4. Šalamun, Ž. 2001: Nova gnezditvena kolonija navadne čigre Sterna hirundo v Pomurju [New nesting colony of the Common tern (Sterna hirundo) in the Pomurje region]. Acrocephalus 22 (104-105): 51-52. Štumberger, B. 1997: Rezultati štetja vodnih ptic v januarju 1997 v Sloveniji. Acrocephalus 18 (80-81): 29-39. Štumberger, B. 1998: Rezultati štetja vodnih ptic v januarju 1998 v Sloveniji. Acrocephalus 19 (87-88): 36-48. Štumberger, B. 1999: Rezultati štetja vodnih ptic v januarju 1999 v Sloveniji. Acrocephalus 20 (92): 6-22. Štumberger, B. 2000: Rezultati štetja vodnih ptic v januarju 2000 v Sloveniji. Acrocephalus 21 (102-103): 271-274. Štumberger, B. 2001: Rezultati štetja vodnih ptic v januarju 2001 v Sloveniji. Acrocephalus 22 (108): 171-174. Štumberger, B. 2002: Rezultati štetja vodnih ptic v januarju 2002 v Sloveniji. Acrocephalus 23 (110-111): 43-47. Štumberger, B. 2006: Rezultati štetja vodnih ptic v januarju 2003 v Sloveniji. Acrocephalus 26 (125): 99-103. Vogrin, M. 1991: Kolonija galebov in čiger v Hočah uničena [Colony of gulls and terns in Hoče destroyed].–Acrocephalus 12 (49): 123. Vogrin, M. 1991: Nova kolonija rečnega galeba Larus ridibundus in navadne čigre Sterna hirundo v Hočah pri Mariboru [New colony of the Black-Headed Gull (Larus ridibundus) and the Common Tern (Sterna hirundo) in Hoče near Maribor]. Acrocephalus 12 (49): 121-122. Vrezec, A. 2000: Vpliv nekaterih ekoloških dejavnikov na razširjenost izbranih vrst sov (Strigidae) na Krimu [Influence of some ecological factors on the abundance of selected owl species (Strigidae) on Krim]. BSc thesis, Biology Department, Biotechnical Faculty, University of Ljubljana, Ljubljana.